Eliana Kissner grew up in South Orange, NJ where she studied traditional Jewish prayer and biblical chanting with Cantor Perry Fine. She completed her Bachelor of Music degree at Hunter College, City University of New York where she studied and performed in operas and classical recitals. After college, she spent a year in Jerusalem studying Jewish music and fell in love with Middle Eastern traditions. After living in Israel, she returned to New York to be an Arts Fellow at the Drisha Institute where she studied Talmud and Jewish law and began writing her own music using traditional texts. Upon completing her studies at Drisha, Eliana moved to the Bay Area. 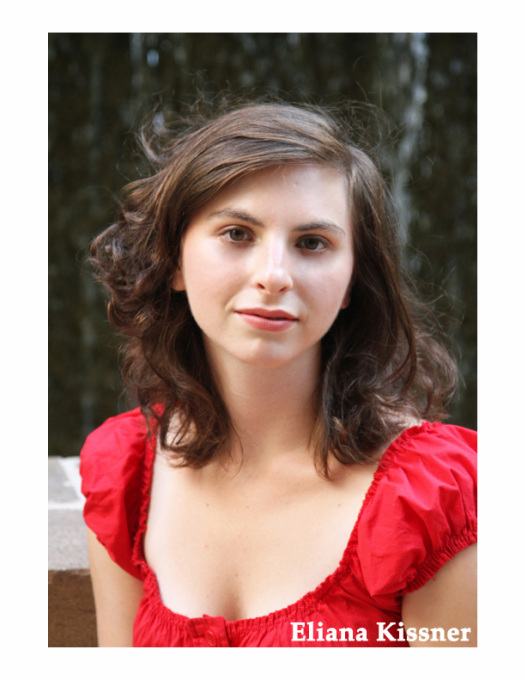 She now sings with Safra, a Jewish Middle Eastern ensemble, and continues to write and perform her own music. Notable performances include Ernestine in Monsieur Choufleuri by Offenbach and Miss Titmouse in Too Many Sopranos by Edwin Penhorwood with the Hunter College Opera Ensemble, Suor Genovieffa in Suor Angelica with the Amalﬁ Coast Music Festival in Caserta, Italy, Mrs. Hayes in Susannah with the New York Opera Project, Zerlina in Don Giovanni with Vocal Productions at Symphony Space, Safra in Holy Harmony, at the 2012 Jewish Music Festival in San Francisco, Sister in Chalom: A Dream Opera in NYC Fringe Festival 2012, solo performer in World Musical Tour with the Jewish Musical Festival 2013, and featured performer in The Time is Now as part of the Under One Tent Festival of Contra Costa country. She has also served as High Holidays cantor in Kochav Yair, Israel, Sosua, Dominican Republic, and is now in her second year with Kol Rina in South Orange, NJ.